Hong Kong welcomed the Olympic torch on Friday under grey and rainy skies. Thousands turned out to support what has been dubbed the "the flame of shame" by human rights activists. Enthusiastic crowds waved the red flag of the People's Republic of China and chanted "Go China," while the territory's police were out in full force to guarantee the torch's first stop back on Chinese soil would run smoothly. Many of the supporters were heard speaking Putonghua rather than Cantonese -- the language of Hong Kong -- and had likely come from the mainland. Friday was a holiday in China, but not in Hong Kong. The first torchbearer, 1996 Olympic gold medalist in windsurfing, Lee Lai-shan, said, "I'm really happy and feel very proud," adding that "Everyone has their freedom to express their idea, but I'm sure the Hong Kong people will respect the torch relay." 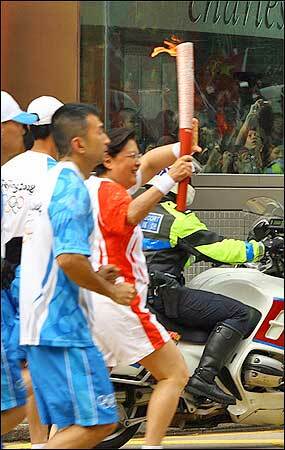 Rita Fan running with Olympic torch. Protesters were also present and tried to have their voices heard despite overwhelming pressure from pro-Beijing supporters and local authorities to silence them. Mia Farrow from Dream for Darfur, was permitted to enter Hong Kong on Thursday and gave a speech Friday at the Foreign Correspondents' Club accusing Beijing of "underwriting genocide in Darfur." But in various locations along the torch route, groups that tried to peacefully voice support for Tibet or democracy or to denounce China's human rights abuses on their own citizens were shut down by angry crowds or by the police. 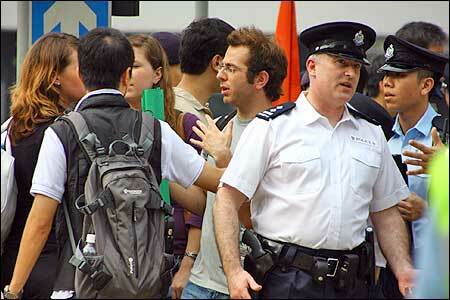 As soon as a sign or Tibetan flag was raised, plain clothes officers identified as "negotiators" wearing backpacks and communication devices would surround the protesters. Official police officers followed closely behind claiming to offer protection from the hostile crowds and in some cases bundling the protesters away in paddy wagons. 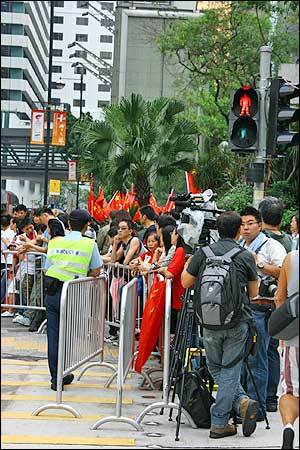 As a result, protesters were often blocked off from the torch relay. Christina Chan, the 21-year-old Hong Kong University student who gained notoriety for organizing an online pro-Tibet protest, managed to unfurl a Tibetan flag with her small group of supporters on Chater Road on Hong Kong Island as pro-Beijing politician and torchbearer Rita Fan passed. Her group was pushed and jeered by the hostile crowd and police moved in. 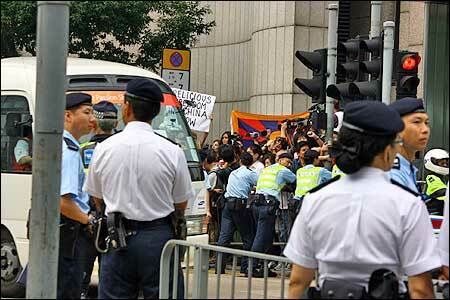 After the torch passed, a police van pulled up and she was taken away against her will. In the run-up to the torch relay, Hong Kong has seen its high degree of autonomy eroded and has endured cultural revolution-style pillaring of people with divergent opinions. Earlier this week, Christina Chan and Wong Yuk-man, chairman of the pro-Democracy party League of Social Democrats, had their Facebook accounts disabled. Chan also had content related to her protest deleted and was told it was for "persistent misuse of the site." On Monday, two other democracy supporters were suddenly prevented from entering Macau, which is an hour away by ferry from Hong Kong. Former legislator Michael Mak and activist Chan Cheong, both members of the League of Social Democrats, were turned back at the border. No reason was given. 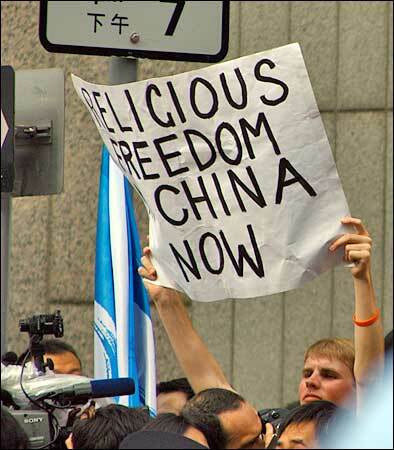 "Religious Freedom in China Now!"